Last July, just before a meeting with Vladimir Putin that Donald Trump hoped would be “very productive,” the president of the United States expressed his interest in pulling out of the North American Treaty Organization, the historic defense pact that has been a cornerstone of American foreign policy for 70 years, according to a new report from the New York Times. 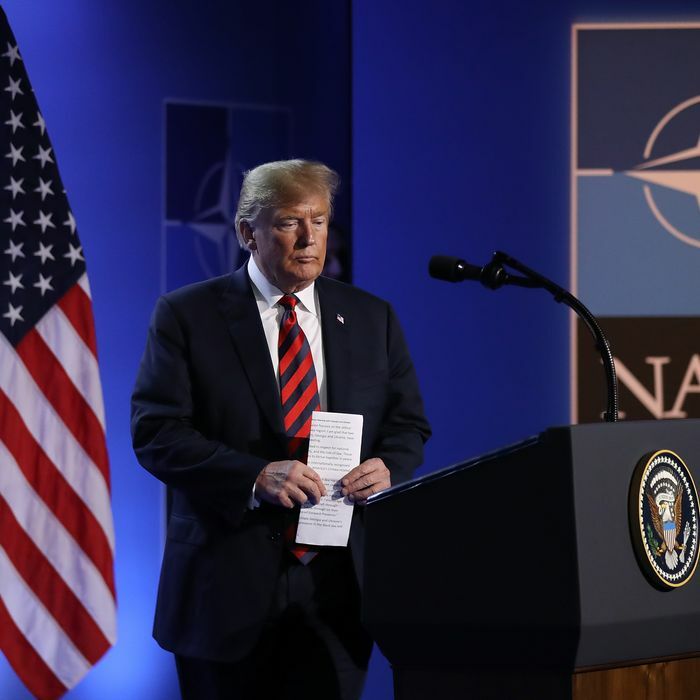 Trump reportedly said in private that he wanted to nix the deal while attending the hectic NATO summit in July, claiming that he did not understand the point of the mutual-defense military alliance. James Mattis, the former secretary of Defense, and national security adviser John Bolton — considered something of a hawkish chaos agent in the White House — reportedly struggled to save face at the summit, as the president smoldered in private, repeatedly throwing out the idea to leave the treaty. At first, the Times reports, senior officials were unsure if he was serious, but they grew more concerned as Trump continued to question the efficacy of a pact in which most of the 29 North American and European signees spend around 2 percent of GDP, while the U.S. spends over 4 percent. To abandon the alliance would be “one of the most damaging things that any president could do to U.S. interests,” Michèle A. Flournoy, an under secretary of defense under President Barack Obama, told the paper. It would also align perfectly with the dream foreign policy of Vladimir Putin, who sees NATO as a major threat to his regional influence. This comes following reports over the weekend that president worked to keep his transcripts of his meetings with Putin hidden from his own aides, and the FBI opened a counterintelligence report into whether or not Trump, as president, was working as a Russian asset. Trump has said he considered NATO “obsolete” since the campaign, and the Times says it’s one of his core beliefs, like his desire to plunder Iraqi oil, which he brings up every few months — even though his staff repeatedly explain to him that he’s not allowed to do that.